Learn how to make anything you want, anytime you want, from the world’s most skilled cooks. Fifteen years ago, a home cook looking to try her or his hand at making, say, gnocchi for the first time, might have had some trouble tracking down the proper advice. Maybe there was a cookbook or magazine article that described the necessary technique, or the home cook had recently seen a food show on PBS that demonstrated the correct way to gauge the dough’s moisture level. The thing that these home cooks could not do, unless they happened to live next to an Italian-cooking expert and were on good terms, was get thorough, detailed advice the instant they wanted it. Now, of course, it only takes a few seconds to find detailed gnocchi-making instructions from Gordon Ramsay, Lidia Bastianich, or Jamie Oliver’s “Italian food guru,” Gennaro. If you want to get really authentic, you can even learn the technique from an actual Italian nonna. Or maybe you’re more in the mood for Parisian gnocchi? Thomas Keller will even tell you which tip size to use when you pipe your dough into the hot water. Streaming sites like YouTube and Netflix didn’t invent cooking shows, of course, but their unlimited capacity for content, and the bite-size segment time of most cooking instruction videos, means there’s never been a time to seek out some simple dinner advice. Here’s why. Anyone can learn to cook anything, anytime they want. The benefits and convenience of on-demand streaming over traditional broadcast models are so obvious and ingrained in us by now that they barely warrant mentioning, except to say that while it’s cool that you can watch the newest episode of Barry or Big Mouth anytime you want, it’s absolutely crucial for cooking instructions — things that people tend to watch in a more active, information-gathering mode. It also means that the people who make these videos want to ensure that you, the curious home cook, will actually be able to find any kind of kitchen advice you could possibly want — and the most popular videos are often the videos that speak to a very specific need. 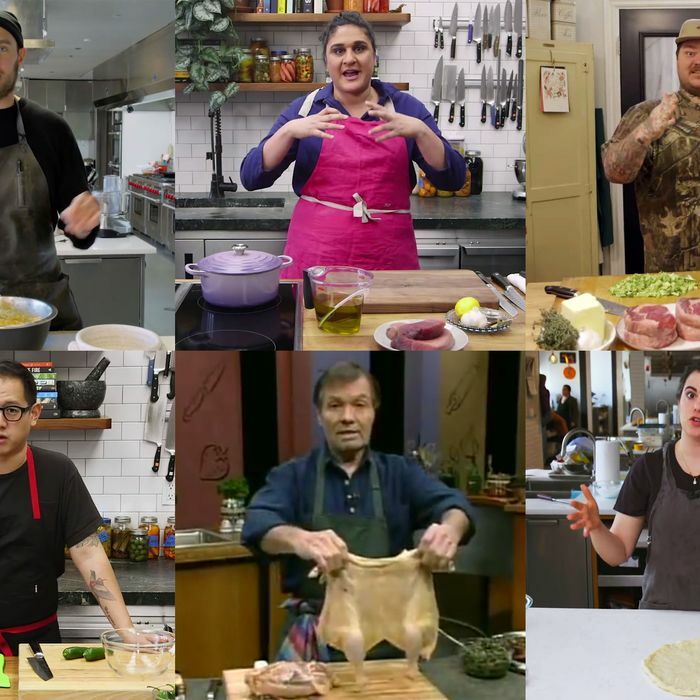 In 2016, for example, Bon Appétit decided to create an entire show about fermentation. Demystifying the skill behind trendy homemade foods (kimchee, miso, kombucha) wasn’t easy, so the video team basically just filmed the magazine’s test-kitchen manager, Brad Leone, brewing beer and lacto-fermenting peppers, then posted the results on YouTube under the fitting title It’s Alive. Bon Appétit, in fact, is essentially mimicking a model pioneered by Vice, promoting its own homegrown talent as cooking stars, and Vice’s Munchies brand — which launched in 2014 — remains a bright spot for the media company. Just last month, Salt Fat Acid Heat’s Samin Nosrat hit the Munchies test kitchen to make what is, basically, the world’s best-looking tuna sandwich, and racked up 400,000 views. Speak of Nosrat, her own Netflix show is proof of what can happen when serious product budgets are applied to this model, too. Though the episodes are understandably less focused than single online videos, Nosrat herself has said that working with Netflix allowed her to “imagine something that looks totally different and feels totally different” from a show that would appear on traditional broadcast television. In other words, if you want to cook something — anything — there’s a good chance that you can instantly find 100 videos that will tell you exactly how to do it. Flaws are part of the appeal. John Mitzewich, better known as “Chef John” of Food Wishes, agrees. In his latest video, “My Big Fat Greek Baked Beans,” he accidentally didn’t soak the legumes overnight in enough water. The next morning, he had a bowl of what looked like small wrinkly brains half-submerged in water. So he showed viewers for themselves, and said don’t make this mistake. “I’ll probably get 100 comments about that,” he predicts. Cooking videos are about to be big business (probably). Last year, Americans streamed an average of two hours of so-called “over-the-top” content (industry-speak for anything you watch on a device like Apple TV or Roku that bypasses cable) per industry research firm eMarketer. Research predicts that this habit will grow to 20 hours a week by 2020, and media companies see the obvious potential. Six years ago, Chris Young — a co-author of the seminal Modernist Cuisine, who also ran the experimental kitchen at Heston Blumenthal’s Fat Duck restaurant — saw a hole in instructional food content. In that time, he’s produced online cooking videos as founder of Seattle-based ChefSteps. It turned out that his Modernist Cuisine co-alum Grant Crilly is great on camera, and their YouTube cooking videos now have racked up over 100 million views, spanning topics from baking naan and growing your own microgreens to making cold brew in two hours with a whipped-cream dispenser. Young points to BuzzFeed’s problems monetizing its own highly successful Tasty videos as an example; it was Facebook’s top content partner in 2018, yet generated no revenue from the platform. To avoid this bind, ChefSteps charges subscribers a onetime fee of $39. This won’t ever score staff a Netflix production budget, but it helps ensure that recipes only have to please customers, not whoever’s willing to advertise next to them — hence ChefSteps recipes like sous-vide squirrel bánh mì.